Attractive and low-key island destination for divers, walkers and adventurers. Ustica is a small island off the north coast of Sicily, reached by ferries from Palermo. The tip of an ancient, extinct volcano, its black rocky slopes and plateaux are now covered in small-scale agriculture, green vegetation and spring flowers. Ustica is, for Italy, very well-protected from development and environmental damage. The waters around the island are a marine reserve, are famously clear and are very popular in the summer with divers and swimmers. Coastal footpaths and a bus service circle the island, so it is also unusually accessible for exploration. The island has a chequered history, including a time when its land was portioned out among colonists. This accounts for the way fields and farmsteads are arranged even now, with long narrow fields running from the inland hillside to the rocky shores. This ensured that each colonist had a range of terrain to farm. 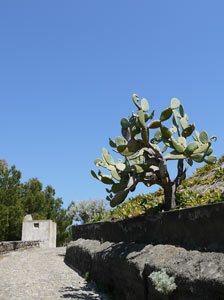 In the nineteenth and early twentieth century, the island was one of several used by the Bourbon and then the Italian government to house confinati, political prisoners sent into an internal exile. Ferries and hydrofoils dock in the island's port, a picturesque curved bay. The main part of the little town - or the Paese, village - spreads out above. The most direct way from the port to the town is by a couple of flights of steps (signposted 'centro'). Cars and scooters follow a winding road up to the heart of town. Hotels will generally meet their guests from the ferry, so there's no need to drag your cases uphill. Ustica's heart is a long chain of three piazzas (effectively one long square) which slope down from the pretty island church towards the harbour road. The sea can be seen from railings just off the main part of the piazza. In this square you'll find bars, restaurants, the marine reserve information office and a few other businesses. Several other shops are situated just off the square; you'll find two or three small food and general stores (look for 'alimentari' or 'market' signs). Character is added to the town centre by large colourful murals which decorate the walls of houses. The oldest nucleus of the town can be found heading behind the church up to the town hall, then turning left down Via Tre Mulini, where you'll find the Case Vecchie, the old houses. These ancient dwellings are on a site used in Roman times, probably for farm buildings, then later for a medieval monastery. The island's eighteenth-century colonists set up their first homes here, before the buildings fell into decay, abandoned or used to house animals. Some are now restored with care, and it's an atmospheric area to explore. In the summer months - especially July and August - Italians and Sicilians come for their summer holidays. Many aim to relax, socialise, sunbathe and swim. Others come here specifically to dive and there are several organisations which organise diving trips. 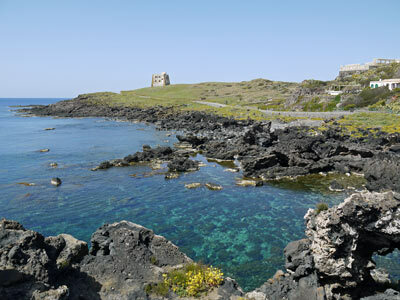 Popular locations include an underwater archaeological trail - like other Italian islands, Ustica is surrounded by shipwrecks and their contents: Roman amphorae, anchors and so on. The water is also rich in marine life. Like many Italian islands, Ustica's swimming opportunities are mostly from rocky seashore. I always recommend asking about the best beaches at your hotel, as they'll be able to advise you on the best place to go based on the wind direction, the latest state of the beaches, whether you have small children, and other factors. The western end of the island, furthest from the town, has some popular swimming spots, both beaches and a picturesque rock pool area called the Piscina Naturale. Boat trips circle the island and its caves, and you can also take a landbound tour on the island's little orange bus. The bus service runs clockwise and anti-clockwise services around the island, varying in frequency according to the time of year. The full round trip only takes about half an hour and is a great (and cheap) way to see Ustica in its entirety. You'll pass long rectangular smallholdings which are still cultivated, vines, olive trees, maybe the odd horned cow or laden mule used as a beast of burden. The route runs right along the rocky shoreline for a while. There are some good walks to do on Ustica, with a simple map available locally, and interesting guidebooks if you read Italian. One of the best walks from town is a short excursion up onto the headland Capo Falconiera, to visit the fortress overlooking the town (on the right as you arrive on the ferry). The Bourbon-era fort was built over and alongside a Roman settlement; nowadays you can explore the remains of both (but take care not to fall in one of the deep cisterns dug centuries ago to collect rainwater). The views over the island and sea are marvellous. The walk up to the headland and fortress takes about fifteen minutes, and offers a range of views and sights of interest, including rock-cut tombs from around the fifth and sixth centuries AD (through a gateway on the left). Ustica's small archaeological museum, located in buildings used in the internment era, contains a collection of local finds including pottery and other items from the island's Bronze Age ruins. Outside the summer season, the museum may be opened only on request - ask locally, or check the council website. There are several small food shops and mini-supermarkets in Ustica town, as well as a choice of bars and restaurants. Fishermen set up a stall in the piazza to sell their colourful catch, while in the little bar opposite you can choose from an array of rich Sicilian pastries. There's a book and stationery store, and one or two souvenir shops selling postcards and pretty ceramics. Self-catering is easy to organise, and so are picnics. Outside the peak summer months you may only find one or two bars and restaurants, but the island's own population is enough to keep basic services going all year round. The peak months for lively holiday activity on Ustica are July and August. But the warm Sicilian climate makes early and late summer very attractive for a sunshine holiday. Between May and September you should find warm weather and opportunities to swim. In spring you'll find the island very peaceful, and colourful with flowers, along with a good chance of mild, sunny weather. I visited in April and found the footpaths carpeted in yellow flowers. 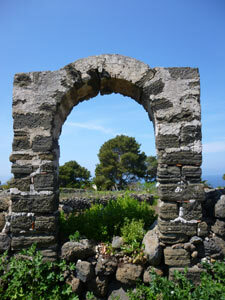 As described above, the things to see and do on Ustica are simple and easily listed. Enjoy views of the sea and over the port; walk up to the fortress and ruins on Capo Falconiera; swimming; diving; hiking; a tour by bus; a boat trip. If you're a keen hiker or diver you can enjoy a few very active days. Otherwise it's a low-key place to relax and get away from it all, with a real authentic island atmosphere. Some tourists visit as a day trip from Palermo when the ferry schedule allows for this. I think it would be a shame not to spend a night or two. 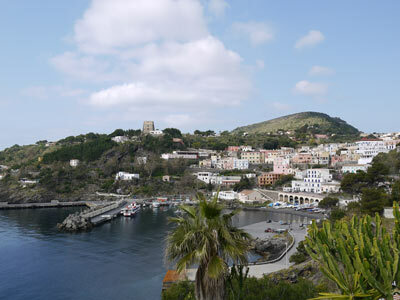 One of the best ways to enjoy Ustica would be as part of a week's holiday split between Palermo and the island: an easy-to-organise trip offering two appealing and completely contrasting experiences of Sicily. One of the very best things to do on Ustica is to walk around the coast. Good coastal footpaths are rare in Italy, and the paths here, as long as they have been cleared and maintained - which they had when I visited - are very good. Visiting in spring I found the island covered in flowers as well as the ubiquitous prickly pears. I never met anyone on the coast path, which was extremely beautiful in places. 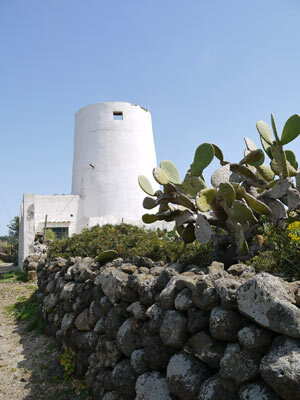 The path along the southern side of the island starts by the Torre Santa Maria, the watchtower on the southern fringe of the town. Formed from old mule paths, it contours through woodland and agricultural terraces, some of which are still in use. The path passes an old windmill, and a delightful rest area with a couple of benches looking over the sea. 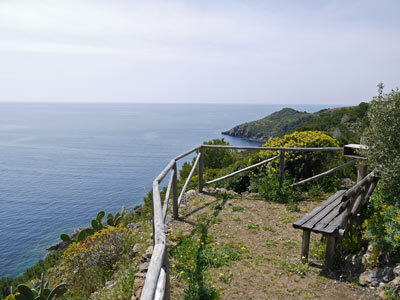 The walk isn't just picturesque and good exercise; it's filled with natural and historical interest, with lots to appreciate including old terraces and flights of steps, ruins, Mediterranean vegetation, birds and butterflies. At the south-western end of the island, the footpath emerges near a tall white lighthouse. Here the land dips more gently towards the sea, and the walking route follows the road along the shore. Minimal traffic makes this fine to walk along, and it's on the route of the island bus, so you can catch the bus back to the town if you'd rather walk the island in sections. The coastal road passes inlets, a watchtower and beaches and coves which include popular bathing places Cala Sidoti and Spiaggia dello Spalmatore, where you'll find a bit of sand. Also to look out for around here are various caves and the Piscina Naturale (near the lighthouse), a large rock pool connected to the sea by an underwater passage. The narrow road climbs uphill at a point where the woods almost meet the coast. 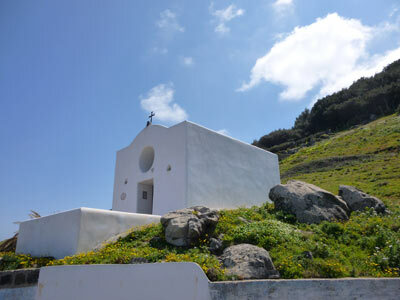 Near the highest point of the road is a small white chapel dedicated to the Madonna della Croce. As the road turns to head back towards the town, another footpath descends ahead, to follow the coastline. This section is very different to the southern shore: quite bare, with cliffs below and a plateau to the south, covered in the narrow fields characteristic of the island. 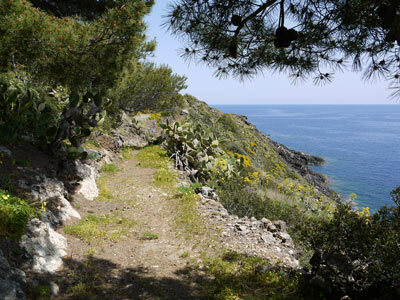 The path passes Gorgo Salato, a natural pool, and continues to the villaggio preistorico dei Faraglioni, a Bronze Age village. Although it's not always officially 'open' out of season, the ruins are easily visible and accessible. The site was discovered in 1970 and is formed of 200 stone huts surrounded by a defensive wall. The settlement may once have been larger, as ruins can be seen on the sea-girt rock stack which was once joined to the mainland. Within the archaeological site you can see quern stones used for grinding corn. The only stretch of coastline which isn't accessible by the footpath is the section to the north of Capo Falconiera. Before you get to this spot, the footpath rejoins the road, passing the island cemetery and rubbish collection point. The road then continues into the town, where you can branch off to walk up to Capo Falconiera and back. A full circuit of the island would take about four hours, as a very rough estimate. However it's certainly more enjoyable if you interrupt your walk with scenic breaks, a picnic or a swim, so I'd allow a whole day - or split the walk into two, and complete it over two days using the bus for one leg of the journey each day. Proper walking shoes or strong trainers are advisable, particularly on the southern path. Take water and food. There's very little shade, so don't forget sun protection and avoid really hot times of day if you can. There are further walks inland, along the wooded slopes of the hill at the island's centre. A circuit along the wooded hillside, around the western slopes and back over the ridge offers a pleasant contrast to the coastal walk, though unfortunately the highest point is fenced off and occupied by a weather station. 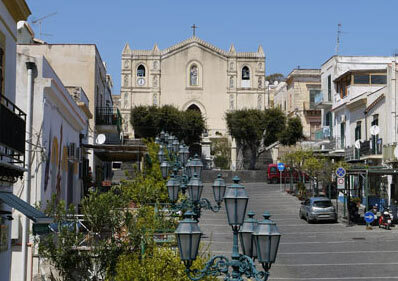 The most convenient airport for Ustica is Palermo, which is served by direct budget and British Airways flights (seasonal) from the UK. Other airlines including Alitalia offer routes with one change. Try to peer out the window as you approach Sicily; your flight path might take you within sight of the island. From Palermo airport you can catch a bus into the heart of Palermo which stops close to the port (Porto). The bus is half-hourly and the journey takes about 45 minutes. Both ferries and hydrofoils connect Palermo and Ustica; the ferry is more scenic but the hydrofoil is much quicker. Ferry timetables vary hugely throughout the seasons, changing frequently. Companies providing services also change, so it is important to check you have up-to-date information. Island hotels are likely to be helpful with advice if you're confused - after all, they have a vested interest in your arrival. At the time of writing Siremar run ferry services (nave) and Liberty Lines operate hydrofoil (aliscafo) crossings every day, weather permitting. For much of the year you're likely to have a choice of at least two or three departure times daily. There's a choice of hotels, B&Bs and rooms to let on Ustica. Unlike some islands, the accommodation here is generally well-reviewed and also very affordable - though there aren't any super-luxury options. The most convenient place to stay is the little town of Ustica itself, close to the port, but there are a few accommodation options outside the town which offer their own advantages such as a more peaceful setting. I stayed at Hotel Clelia, which is a very central and decent place to stay. For more of a holiday atmosphere, you can find sea views at the aparthotel Residence Stella Marina and at Le Terrazze Studio Apartments, which has a sun terrace and a tiny pool. Further from the town and port, more rustic options include the Agriturismo Hibiscus, which offers accommodation on a farm growing fruit and vegetables.